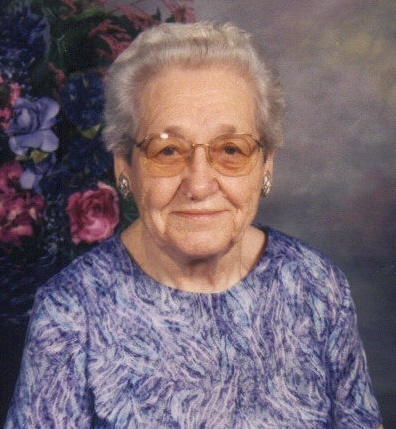 Regina Evelyn Sweeney, 98, passed away September 12, 2012 at Golden Living Covington Heights in Sioux Falls. She was born on February 22, 1914 on a farm near Ramona, SD to James and Josephine (Burkler) Carmody. At a young age, the family moved to Texas for a short time. They moved back to the Ramona area where she attended country school. In 1933, she graduated from Winfred High School. As a young woman, she and her sister loved to go to dances. She was teased about dancing with Lawrence Welk. Her family was always on the go - if a car went someplace, they would all get in. Then they would ask where they were going. Regina married Henry Sweeney on January 12, 1938 in Oldham, SD during a blizzard. They lived in the Ramona area until 1950 when her family moved to Sioux Falls. Regina (Jeannie) was a mother (to all) and a homemaker. Her house was always full of kids. She would always provide rides to anywhere we wanted to go. Sometimes, she would fill her Studebaker with kids to get an ice cream cone. Many times, there would be 15 kids in the car. Regina was a member of Cathedral Club, Saint Vincent DePaul Society, Blue Army and Catholic Daughters. She volunteered at Cathedral School, was a Girl Scout leader and delivered meals on wheels. Regina is survived by sons: Jim Sweeney, Monroe, Paul Sweeney, Joe (Juanita) Sweeney, and daughter Donna (Dave) Underberg, all of Sioux Falls; grandchildren: Jimi Sweeney, Lisa (Dave) Clippard, Danielle (Steve) Sandig, Mikki Lund, Keith (Justine) Lund, Chris (Jodi) Sweeney, David Underberg and Bobbe (Jason) Wingert; 15 great-grandchildren;Â 6 great-great grandchildren; sisters: Josie Soderberg, Brookings, Dorothy Timmons, North St. Paul, MN. She was preceded in death by her parents, husband, 3 brothers: Vincent, Joseph and Raymond; and 5 sisters: Cleo Carmody, Angeline Carmody, Margaret Schafer, Agnes Bigger and Eilene Nelson. Visitation will be Sunday, 6 PM at Barnett-Lewis Funeral Home with a Scripture Vigil at 7 PM followed by a Catholic Daughter Rosary. Mass of Christian Burial will be Monday, 10 AM at the Cathedral of St. Joseph with burial to follow at St. Michael Cemetery.